Currently, there are 150 million chemicals registered and managed by the American Chemical Society. Every day, 15,000 to 20,000 new chemicals are registered. These chemicals are present in everything from our household cleaning products to the food we eat. But how do these chemicals affect us? And how do they affect the environment? A research group at the Bren School of Environmental Science & Management at UC Santa Barbara, with funding from the Environmental Protection Agency (EPA), works to answer those questions for the masses with the Chemical Life Cycle Collaborative (CLiCC) tool. 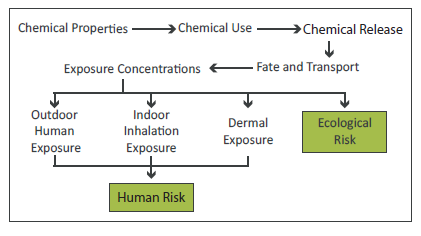 The CLiCC Tool estimates chemical life cycle impacts, human health risks, and hazard information using 11 unique modules. Now all interested parties can access collections of available study data on a chemical’s toxicity and sustainability, or predict missing values using machine learning to help alleviate the backlog of new chemicals under consideration by the EPA. Previously, there was a mounting demand from industry for a tool to understand the impact, lifecycle, and risk of chemicals without the need for expensive tests. If a company wanted to test the toxicity of a certain chemical, it could cost hundreds of thousands per chemical analysis, which is one of the reasons chemicals are often commercialized without a thorough human and ecological risk assessment. Now, with access to a cost-effective tool, companies that sell products containing chemicals can use actual findings when making decisions as opposed to just following public perception. In order to make this tool accessible and cost-effective, the team turned to Amazon Web Services (AWS). The CLiCC tool is hosted on AWS using six Amazon Elastic Compute Cloud (Amazon EC2) instances (three for staging and three for production) to host the website with high availability, conduct necessary scientific modeling, and process user inputs. CLiCC also uses Amazon Simple Storage Service (Amazon S3) and Amazon Relational Database (Amazon RDS) to store the necessary data to run the models. Amazon Cloudwatch and Amazon Route 53 are also used to help manage the tool. Through machine learning, the tool can predict the environmental and human health risk of a chemical based solely on its structure by looking at its similarities to other chemicals. Anyone can log in from around the world and enter the name of the chemical. The tool identifies what chemical it is and the risk factors instantaneously. “AWS is instrumental and an essential platform to enable our services. Our work requires a lot of modeling and computation that would not be possible with our on-premises infrastructure. With AWS, we have immediate access to an affordable, scalable, and powerful tool that required zero upfront investment on our end,” said Dr. Sangwon Suh, a professor and the director of the CLiCC program at the Bren School of Environmental Science & Management. The Chemical Life Cycle Collaborative (CLiCC) at UC Santa Barbara is a training ground for the next generation of leaders in the field of chemical life cycle and environmental and health risk assessment. Since its inception, CLiCC has employed 15 student researchers from undergraduate, masters, and PhD levels who have gone on to work in sustainability roles at firms such as Amazon, Oracle, Disney, and Quantis International, among others. CLiCC was also home to three postdoc researchers, who now hold professorial positions at Leiden University, University of Nevada (Reno), and Texas A&M (Corpus Christi). There are three current students working on CLiCC who are studying at the undergraduate and PhD levels. A robust user base of members will ensure that CLiCC remains fertile ground for new generations of experts in this critical specialization. CLiCC is an interdisciplinary collaboration between researchers in the Bren School of Environmental Science & Management and the College of Engineering at UC Santa Barbara. Learn more about the Bren School, CLiCC, and research on AWS. The Bren School is a graduate school at UC Santa Barbara offering a professional master’s program and PhD in Environmental Science and Management. The mission of the Bren School is to solve environmental problems by developing interdisciplinary solutions, training environmental leaders, and working for a sustainable future.